You can see the rest of this fall shoot set on my photo blog. I have many fond associations with autumn. Besides the fall colors and our (mine and Jeremy’s) birthdays, it’s also that time of year for BlogHer Food in San Francisco. BlogHer Food ’09 is where I met Shauna and Danny and little Lu. I don’t go to these conferences intent on meeting (or stalking) specific people unless they are already my friends. So when I met Shauna, I was vaguely aware that she was Gluten-Free Girl. I just knew she was incredibly sweet and that her baby girl kinda ran off with my heart. It was only on our second meeting together at Kingsford University that I became aware of her rock star status (so I’m slow on the uptake, cut me some slack!). But that rock star status is nothing compared to the lovely woman she is. I got to talk with her and Danny on the bus ride into wine country and by our final dinner of the trip they told me about The Beatles, their first date, tattoos, and why Danny was sharing his bottle of lemonade with me. When I was at IFBC in Seattle, I got to flip through Shauna’s only copy of the book. It made me hungry. I don’t go out of my way to be gluten-free since I like gluten and I can eat it. I can eat the hell out of gluten. So a gluten-free cookbook has to appeal to me at the cooking level, not at the gluten-free level. And this is what I find so special about the book: if you were to erase all mention of gluten-free in the book, it would stand on its own merit as a damn fine cookbook. That’s the magic in the book. That’s the magic in how Danny and Shauna cook and live their lives. By the way, this isn’t a proper review – it is merely my heavily biased opinion. I haven’t read the book cover to cover yet as autumn is my busiest time of year. But when I began flipping through the book to tag the recipes I wanted to try, I found myself reading. Shauna has a beautiful writing style and writing voice. A couple of paragraphs into the introduction, her words made me catch my breath and I had to blink back a few tears… because Shauna and Danny are two people I care about very much and their hopes and happiness bring me great joy. It’s about the journeys of discovery, growth, love, happiness, learning, and really incredible food. Every time I open the book I get sucked in by the stories, restaurant behind-the-scenes, recipes, tantalizing photographs, and cooking tips and instruction. It’s a miracle that I ever set it down long enough to step into the kitchen and make a recipe. The one that demanded to be first was the pumpkin soup. It’s autumn. 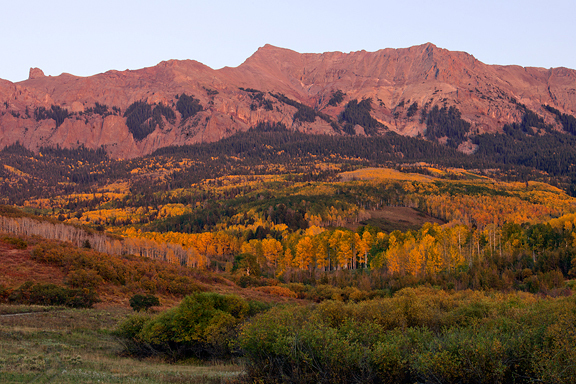 I’ve been chasing fall colors around Colorado for the past three weeks. 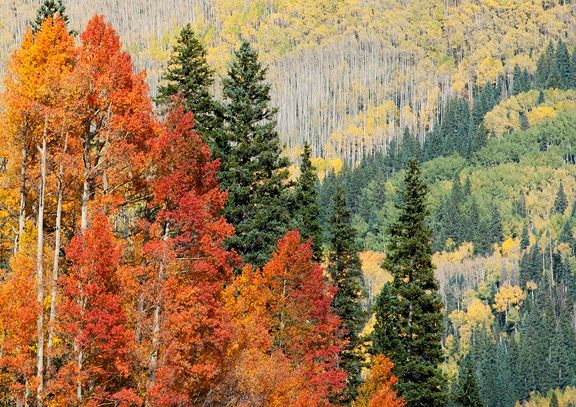 I have autumn on the brain – big time. This recipe is like a special gift to the cook, because it is full of vibrant colors and heady aromas when you prepare the soup. The process itself is beautiful. 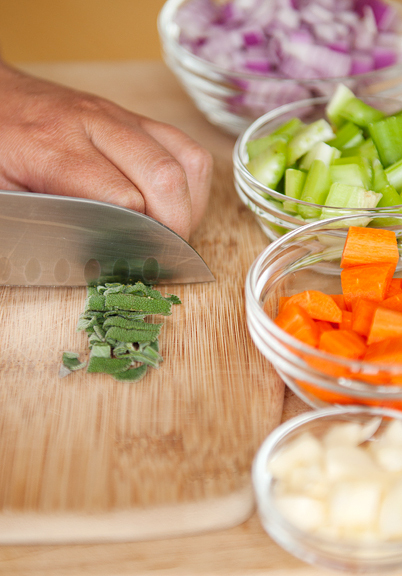 Once you have your mise en place (mess in place), the soup comes together quickly and easily. And then you blender it. Danny suggests that you purée 75% of the soup and then strain it. I managed to completely not read that little bit of instruction and didn’t strain anything. I thought the chunks from the remaining 25% might lend to an odd experience, but I quite loved the bits of soft sweet potato, carrot, celery, and onion. I imagine it’s a matter of preference. If you like smooth purée, go for it. Just don’t diss on the chunky version until you’ve tried it. The lesson: trust Danny. I was supposed to garnish the soup with the roasted pumpkin seeds, but I was looking for an excuse to fry sage leaves in butter! Just melt butter in a pan on medium to medium-high heat and drop whole sage leaves in. They fry up crisp in no time. Be sure to make extras because they are that good. I also fried a few slices of Yukon gold potato for garnish, but I could take it or leave it. 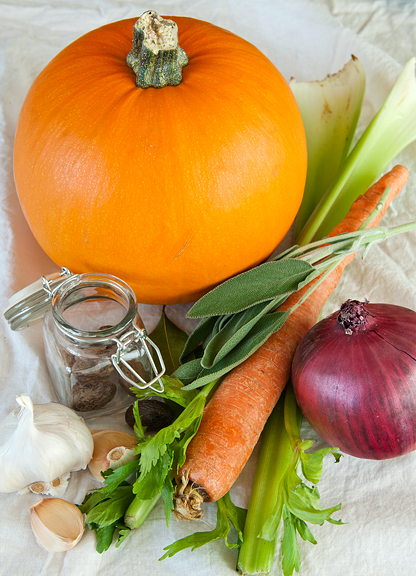 The pumpkin soup is hearty and satisfying, something that serves as a meal in itself. I made half the recipe and there are easily four soup servings from just the half. I can tell you though, you won’t regret making the other half of the recipe… or getting the book for that matter. Full disclosure: I received a free copy of Gluten-Free Girl and the Chef from John Wiley & Sons, Inc. I was under no obligation to write about or review the book. Heat the oven to 450°F. Lop the top off of the pumpkin and cut it into quarters. Scrape out the seeds and the innards and set the seeds aside. 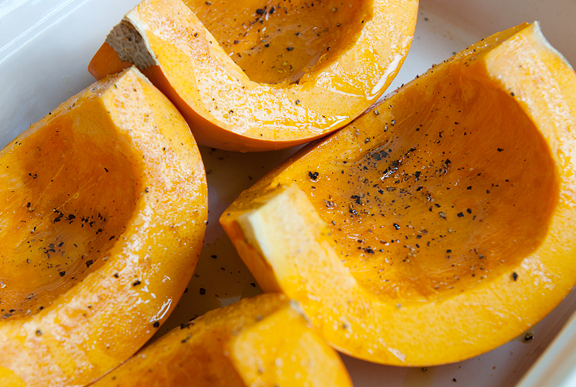 Place the pumpkin quarters in a baking dish and drizzle with 2 tablespoons of olive oil. Season with salt and pepper and bake for about 30 minutes or until the pumpkin is soft enough to scoop with a spoon. Let cool to room temperature. Spread the pumpkin seeds on a baking sheet and lightly coat with 2 tablespoons of olive oil. Bake in the oven with the pumpkin, until the seeds start to brown (5 to 10 minutes). Remove from oven and season with salt. Scoop the pumpkin flesh from the pumpkin and set aside. Place a medium stockpot over medium heat. Pour in the remaining 2 tablespoons of olive oil. 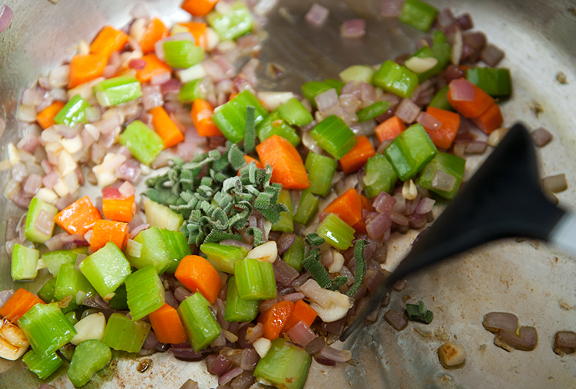 Add the carrot, onion, celery, and garlic to the hot oil and cook. Stir occasionally until the vegetables are softened and the onion is translucent (takes about 10 minutes). Add the sage and cook until you can smell the aroma of the herb. Add the sweet potato, nutmeg, and bay leaf to the stockpot. Pour in the chicken broth and pumpkin flesh. 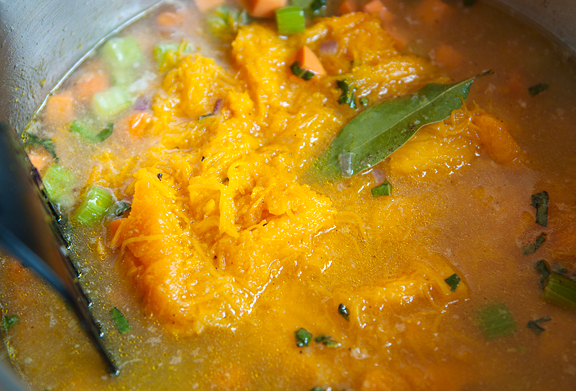 Bring the soup to a boil and then reduce to a simmer for about 15 minutes or until the sweet potato is fork-soft. 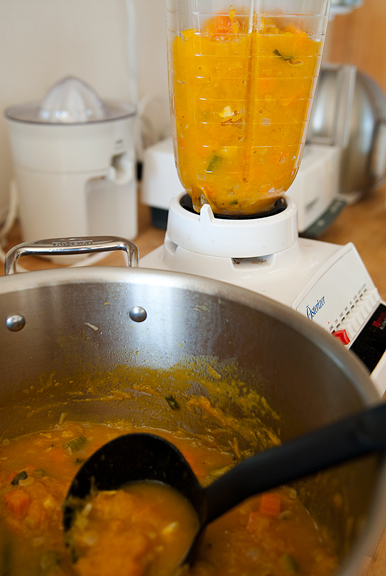 Remove the bay leaf and purée three-quarters of the soup in a blender and push through a strainer (whoops! I forget to strain it). Season with salt and pepper to taste. Add the cream and butter. Bring soup to a boil and reduce to low heat. Let simmer until soup is thickened to your liking (about 10 minutes). Serve with pumpkin seeds and a dash of the pumpkin seed oil per bowl. [Jen’s note: I used olive oil and I garnished with fresh sage leaves fried in butter and thin slices of Yukon gold potato fried in oil.] Serves 4 (generously). i love the flavours of sage and bay leaf in this. pumpkin is just wonderful like that. what a delicious soup! Wow – the photos are stunning – thank you for sharing it with us! I have to try this soup!! I love, love, love, pumpkin soup! 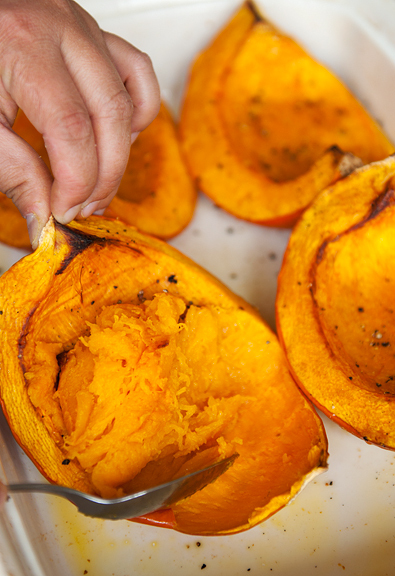 Roasting the pumpkin makes the flavors even more delicious. And the vibrant color? Beautiful! What a gorgeous soup. 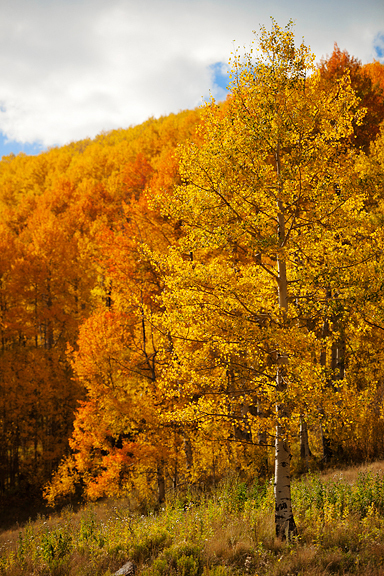 I also love your opening fall photo. Stunning colors! 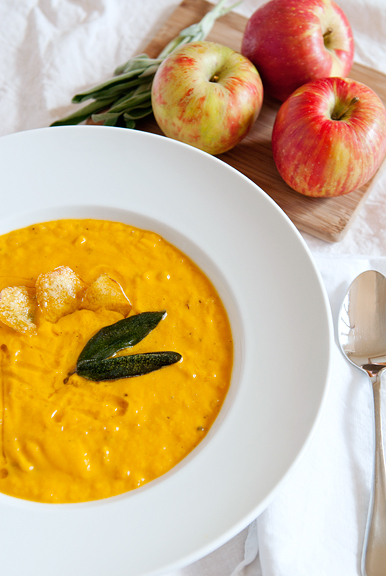 Pumpkin Soup has never been that appealing to me….until now! This looks like a fantastic recipe and your photographs are gorgeous. 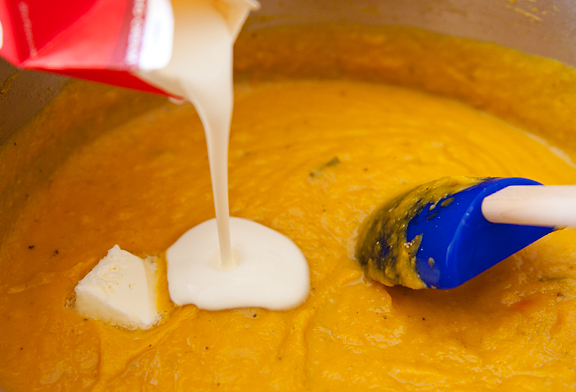 A lovely fall soup, indeed! 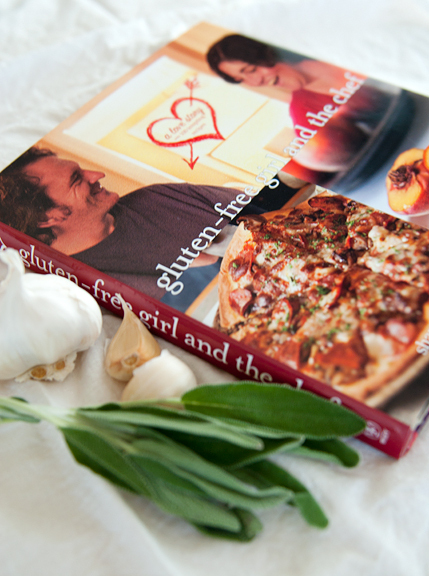 I love my gluten, too, but I’m looking forward to getting my hands on Shauna and Danny’s book. That looks like a really delicious soup. I will have to give this a try. Thanks for sharing! is exactly why I always loved the food (hers, his) on G-FG (plus, you know, her WRITING!). It’s just good, no matter who you are or what your parameters may be. Love the fall photos. 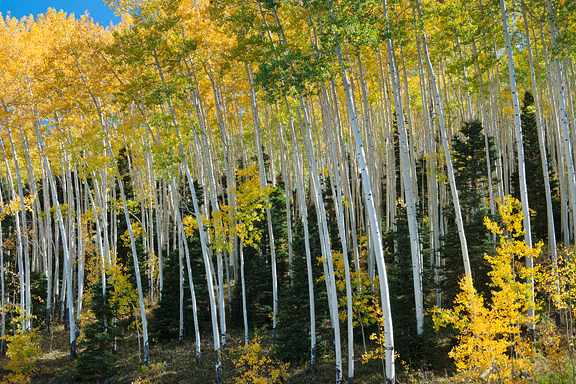 Having photographed large landscapes, I always have to smile at the whole “scope” issue. I can never quite capture it. You do a much better job than I and, even so, I look at the second and third photos up there and just know how HUGE it must have really been in person compared to looking at it on screen. I was just about to start looking for a Pumpkin Soup recipe for Thanksgiving. Last year I served a roasted butternut squash soup with caramelized pears and crispy proscuitto. This year I want to mix it up a bit. Thanks! I love love love Gluten Free Girl and the Chef. What an inspiring blog/cookbook/stories. I love the soup. It looks so good. The photo’s jump off the page, and for a moment I thought Smell-O-Vision actually existed. This is a must-do in the weeks ahead. I feel from this post you are living life on fast forward at present. Enjoy every moment. I’ll be making that soup (which would be great with the parmesan and bacon crackers of your last post ). One of my favorite soups. This one sounds really tasty. I wanted to let you know that I was unable to access your blog from Mozilla. I received an error a few times. I’m enjoying reading you blog, and I’m anxious to check out this book! I love soups but I’ve never heard of this one. I’m going to try this out really soon. thanks for sharing. Whenever I look at your beautiful landscape photography, I feel the urge to forget all about my fear of flying and visit your beautiful state despite the 10 flight hours from Berlin! Luckily, I can at least enjoy the food by making your recipes! Pumpkin soup is one of my favorites of all time. It is so, SO good. And Jen, your photography is REALLY inspiring to me. ok, silly question, but what do you do with the remaining 25% of the soup that doesn’t get pureed? i adore your pic Jen, and the whole post of autumn, and my my yum soup can’t wait to try! Soup looks delicious.You’re pictures are unbelievably gorgeous! I live in South Florida,so,your pictures really make me want to go out there.Thank-you,for your beautiful blog! Wow!! Stunning pictures….I enjoy reading your blog very much, thank you for the recipe. I live in Vanuatu, and its this time of the year that pumpkins are at their sweetest point and in so much abundance. 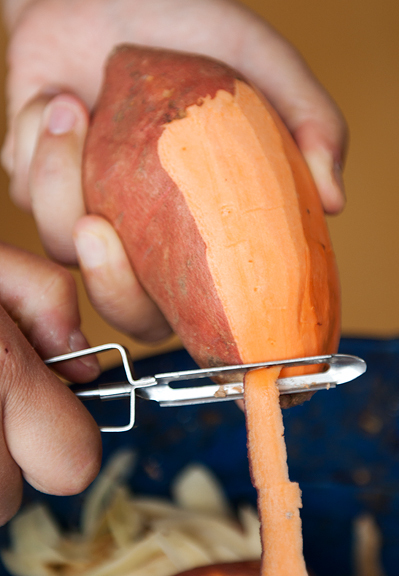 Your sweet potatatoe is called Kumala in Vanuatu and yes it does fall under the catergory of potatoes. 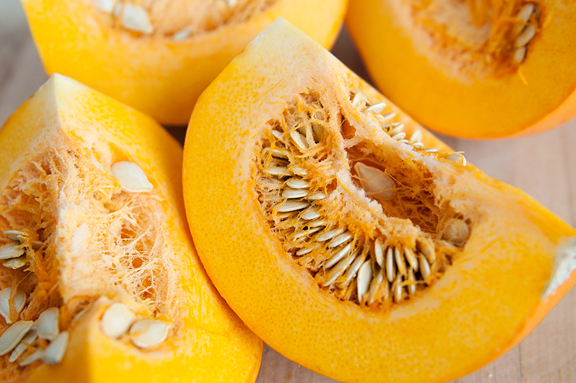 Yams have a more different in texture to kumalas. and that soup! Fall incarnate. This has been a lovely post. Thank you for sharing. Mmm. Anything involving pumpkin gets my seal of approval! That looks so delicious! I just purchased my first sugar pumpkin of the season and was wondering what to do with it… I think I just figured it out! The soup looks divine! Gorgeous pictures as well, nicely done. Kath – you’ll love it. It’s so beautiful in many ways. Melissa – TOTALLY with you there, babe. Shauna and Danny are really wonderful people to boot. Lori – that might have been because my server has been sucking lately. Looking to move my sites from that service, but won’t have time for another month. Sorry about that!! Carole – you mix it back in with the purée. I thought it was odd, but after having had the soup, I love it!! Ohhh! It has been a long time since I made pumpkin soup and everytime I visit the grocer, he will beckon me to get some pumpkin but I don’t relent every time. This weekend, I shall!! !